Last year for Tet (Vietnamese Lunar New Year), I made char siu bao (Chinese barbecued pork buns). I didn't like the bun part of the recipe but loved the char siu part. The original recipe was way too laborious though. I've heavily shortened a lot of the steps and adjusted amounts resulting in a moist and flavorful barbecued pork. The main difference with my recipe is that it's not so excessively sweet and omits that unreal pink color. So if you must have it, by all means use the packaged mix with food coloring. Or do as I do, use ketchup and the pork will be red, just not unnaturally red. 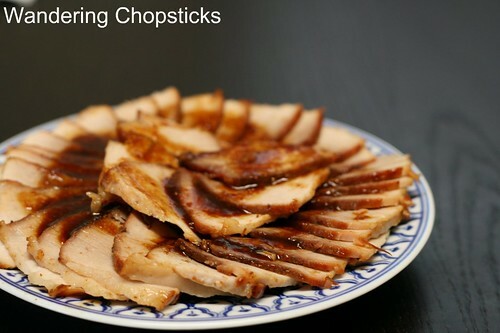 Char siu, which means "roasted on a fork," is traditionally skewered and roasted over an open fire. 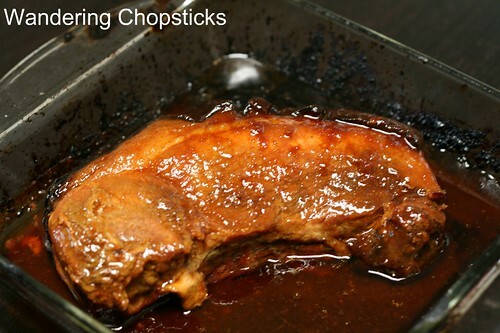 Using honey in the recipe and cooking the meat in a shallow pan in the oven will achieve a similar shiny glazed effect. Char siu is Cantonese, in Mandarin it's cha shao, and in Vietnamese it's xa xiu. Mix all marinade ingredients thoroughly and take a taste, adjusting if necessary. Then slather marinade all over the pork. You can let the meat marinate for several hours or overnight in the fridge, but I've baked it right away and still achieved plenty of flavor. Bake in a shallow pan in the oven at 350 degrees for 30 minutes. The marinade will start thickening at this point. Flip the meat, making sure to baste the meat in the marinade, and bake for another half hour. Check for doneness. When the pork is almost done, broil for 10 minutes to get the pork crispy and charred. Check and make sure the sugars don't cause the pork to burn. 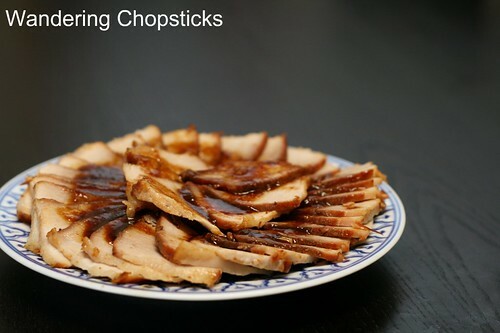 Remove from oven and let char siu rest at room temperature for 10 to 15 minutes to let the juices redistribute. Slice thinly to serve. When I was little, my mom used to make xa xiu (the Vietnamese spelling of char siu) quite often. Always from the package though. She'd make me slice the meat as thin as possible and arrange it like so. I guess some things linger into adulthood. You can use this marinade on ribs and it'll still turn out juicy and delicious. But, don't take my word for it. You can also toss in a few pounds of wings into the pan and make Canh Ga Xa Xiu (Vietnamese Chinese Char Siu-Style Barbecued Chicken Wings). Who made my recipe for char siu/xa xiu? Nikki Polani said, "I don’t think I could go back to that reddish spice mix again!" 1 year ago today, tender and flavorful spare ribs and bok choy chow mein noodle soup at Phoenix Food Boutique in Alhambra and San Gabriel. Delicious! Brings back memories - even though my mom never made me arrange it all pretty on a plate. I've only tried xa xiu once or twice with the red packet, but will give your recipe a try! I wouldn't mind if the color came naturally from something like beets, but I'm trying to cut out artificial food colorings if possible. I can't believe you tried it so soon! Let me know how it turns out in a crock pot, I've never thought of that. I'd want the nice glaze though. Maybe cooking it in the crock pot, and then broiling it for the glaze? What a nice presentation! At the most I can only layer it straight and not make it like a pinwheel like yours. 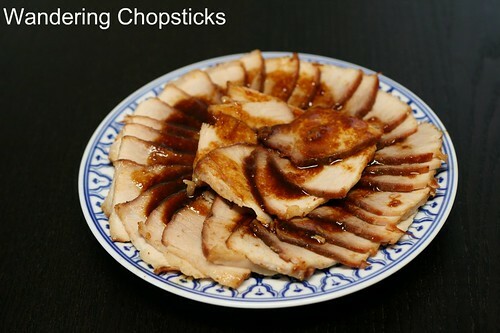 I make char siu with pork neck meat but I haven't tried making it without the char siu sauce from Lee Kum Kee. 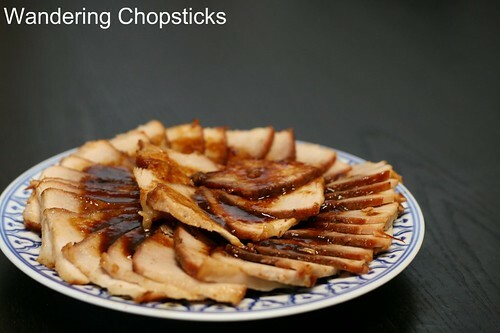 I'll try this out someday when we want to eat char siu :). Looks great WC. I was screwing around with Filipino Humba a few weeks ago (kinda similar) and I just used brown sugar. But I can see how honey and hoisin could add extra dimension and more sweetness. i think i probably won't make chinese char siu in hk...as they are easily available at affordable price here...but in case i have to move overseas next time, i should give it a go, eh? This looks incredible and I just so happen to have a 3lb shoulder of pork in my freezer right now, dinner is served! Brown sugar is great for complexity in sweetness too. Hmm. Now curious about Humba. Too cheap! Why bother when you're in Hong Kong. Although, it's pretty cheap here and I like my homemade version better. Not so sweet. This does sound good and looks very appetising, however, the traditional Xa Xiu/Char Siu whether Chinese or Vietnamese is red in color. I've always made mine by adding red food color rather than using the Xa Xiu packing which tends to have some MSG. Umm, did you not read the post at all? The whole point of making my own char siu is to avoid artificial coloring in my food. Why bother doing that and then adding in fake red food coloring? Thanks for the recipe! This has become a mainstay at my house--everyone I've tried it on loved it. It turned out awesome every single time, and reminded me of when Mom would bring back cha siu from Chinatown and we'd eat it with sliced cucumber. I missed the red color a teensy bit at the beginning, but not having additives in the food is worth it. Thanks so much for the feedback! So glad everyone in your house likes it. Reminds me I haven't made this in a while either. So glad you liked it. I don't like using those powder packages much because of all the MSG these days. I prepared a lot of sauce and store it in the fridge. It stayed good for quite a while (at least 2 weeks). I used the sauce various types of meat, even for chicken & it turned out very good! Super tasty! Thanks a lot, Wandering Chopsticks! Good to know. I didn't even check to see if the sauce would last for weeks. Wow, I've used jars of cha Sui but this is so much more delicious! We have just returned from Vietnam where I fell in love with the food! So as usual, my family are reaping the results of my travels! Thank you for all the wonderful recipes that I can now practice on my family and hope that I get get it close to authentic Vietnamese food! Wow! I have just returned from Vietnam where we fell in love with the food! My (poor?) family are now reaping the benefits of our travels and this is the most delicious Cha Sui recipe I have come across! Sure beats the stuff in a jar! Thank you so much for providing recipes for some of my favorite foods and I hope I can do them justice! At the moment a big pot of Pho is simmering away and the menu for tomorrow includes- homemade rice paper rolls (with home made rice paper! ), taro puffs, braised chicken and ginger, garlic fried rice and eggs, claypot eggplant and a purple yam pudding! Can't wait to see if they work out ok! Thanks again! Oh! I am so jealous of your recent trip to Vietnam. It's been years since I've last been. Your meal sounds wonderful. I am making this right now! It is sitting in the oven and smells delicious! :D Thank you so much for the recipe!